1) Four Amish young adults are charged with drinking while buggying (DWB). The Amish and their buggy collided with a police car. The police car was responding to reports of drinking at a party. 2) The Amish were charged with illegal possession of alcohol. 3) Adding more intrigue, it occurred on a Sunday. 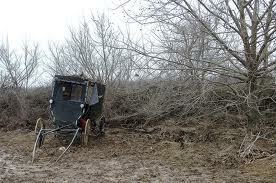 4) Police report that several other buggies fled the scene. Maybe the rumors of 12-2012 and the end of the Mayan calendar have some credibility. Question of the day: in North Carolina, can one get a Driving While Impaired (DWI) on a non-motorized vehicle (eg. A bicycle, horse drawn carriage)?